John Wilson, alias Dr Jock Hornbook, the eponymous victim of Robert Burns’s hilarious satire,1 would be in court today for practising medicine and dispensing drugs without a license—that is, if he hadn’t already been jailed for culpable homicide. However, in the eighteenth century things were somewhat different. Then, it was not unusual for a Scottish village to have no GP. Hence enterprising grocers, and schoolmasters like Wilson, armed with a medical handbook and a gift of the gab, might well go into practice. Indeed it was not till the Medical Act of 1858 that medicine and surgery were made the exclusive province of the medically qualified. The ‘physician’ of the Burns masterpiece was born in Glasgow in 1751 into a weaving family. He was at Glasgow University in 1769, but not studying medicine. A dominie, he taught first at Craigie in Ayrshire, before being appointed in 1781 to the school in Tarbolton, in preference to the poet’s friend David Sillar. He got his poetic surname from the ‘hornbook’ of the classroom. This comprised a sheet of paper carrying the alphabet, the ten digits, the Lord’s Prayer and elements of spelling. Mounted on oak wood and covered by a protective plate of transparent horn, they were in common use as a primer in schools until the close of the eighteenth century. The poet’s younger brother Gilbert recorded that to eke out his scanty living, Wilson opened a grocery shop in Tarbolton where he sold medicines. He also offered advice ‘in common disorders’, gratis, there being no practising physician in the village. It seems that Wilson picked up his medical knowledge from such works as Dr William Buchan’s Domestic Medicine (1769), which was hugely popular in its day. From a medical viewpoint, Dr Hornbook provides a fascinating insight into the eighteenth century practice of medicine in rural areas by unlicensed operators. 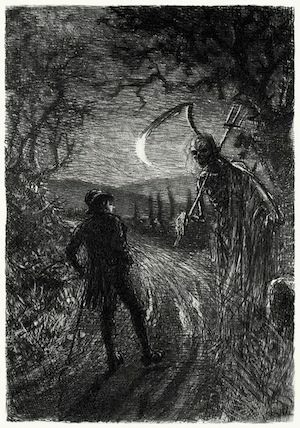 Death, envisioned by Burns as a loquacious mobile skeleton toting a scythe and a ‘leister’ or dart, intercepts the poet as he is weaving home from a heavy night at the local inn. Since the problem is not the length of the road, but rather the width of it, the poet is happy to sit down for a blether with Death, who is far from happy. He complains bitterly that Dr Hornbook is actually doing his job for him. We first hear that the ‘bold apothecary’s’ diagnostic practice does not even require him to see or examine patients. However, not for him the epistolary ‘Medicine by Correspondence’ then conducted by the elegant Professor William Cullen of Edinburgh. For Hornbook in rural Ayrshire, says Death, one can ‘[…]just shite in a kail-blade, an’ send it'[! ]—Hornbook will examine the specimen and instantly diagnose the problem. The poet goes on to parody Hornbook’s Latinity, the device with which doctors have always disguised and thus gentrified simple nostrums. For example we learn that Hornbook dispenses: sal-marinum (common salt); Aqua-fontis(spring water); farina (bean flour), together with the more alarming Urinus spiritus (hen pee) and Sal-alkali of midge-tail clippings. Only for the latter is there no entry in the 1780 Pharmacopeia of the Royal College of Physicians of Edinburgh. Burns drew the inspiration for Death and Dr Hornbook on listening to Wilson airing his medical knowledge in the local Masonic Lodge, of which Burns was a member. Gilbert Burns recalled his brother reciting it to him in the fields the day after its composition, and it appeared in the second (or Edinburgh) edition of Burns’s Poems in 1787. The poem should not be seen as a personal attack on John Wilson, who was Secretary of the Lodge. He and the poet remained on good terms and indeed Wilson was probably in on the joke. The work is simply a further example of the poet’s sheer skill as a satirist. The diversification of his activities eventually led the parishioners to accuse Wilson of neglecting his pedagogic duties and to demand his replacement. Because of this—and also because, while Clerk to the Kirk Session, he quarrelled with the Rev. Dr Patrick Wodrow—Wilson would leave Tarbolton in 1793. However, all was well when Robert and Gilbert moved their now widowed mother and their sisters to the farm of Mossgiel nearby Mauchline, in 1784. John Wilson as Session Clerk and Wodrow as minister signed the ‘Certificate of good Character’ required by the church law of the time. Wilson heeded the poet’s warning, abandoned his idea of going to the capital, and went instead to Glasgow. Here he taught for a time in the High Street, later opening a ‘Commercial Academy’ in Buchan Street. He became Session Clerk of Gorbals Parish in Glasgow, an appointment he held for thirty years. Death finally claimed ‘Dr Hornbook’ in 1839. He lies in Glasgow’s Gorbals cemetery, his medical reputation undimmed by time. While devoting his time to writing, broadcasting and his public speaking, Professor Purdie is also Chairman of the Sir Walter Scott Club and the Edinburgh Burns Club, a Patron of the JP Morgan Library, New York, and of the National Galleries and National Library of Scotland.